Based on an incredible true story, Jennifer Garner ('13 Going on 30', 'Dallas Buyers Club') stars in a tear-jerking performance as Christy Beam, telling the sorrowful hardships of the Beam family. 'Miracles From Heaven' also features a stellar supporting cast including, Martin Henderson ('Everest', 'Grey’s Anatomy'), John Carroll Lynch ('Ted 2', 'Crazy Stupid Love'), and Queen Latifah ('Valentine’s Day', 'Ice Age'). Christy Beam discovers her 10-year-old daughter Anna (Kylie Rogers, 'Fathers and Daughters'), has a rare disease, and the young mother turns to religion in a desperate attempt to find a cure for the incurable. Christy is rejected time and time again by a series of condescending doctors, and becomes a ferocious advocate for Anna’s worsening condition. A mysterious solution arrives after Anna has a freak accident, and an extraordinary miracle unfolds in the wake of her dramatic rescue. After enduring great suffering, the symptoms of her disease begin to disappear, restoring the Beam family’s faith in God. The 'Miracles From Heaven' competition has now closed. Winners will be announced shortly. Competition opens at 5pm AEST on Sunday 12th June 2016 and closes at 11:59pm AEST on Sunday 19th June 2016. Five winners will be chosen at random on Monday 20th June 2016. To successfully win, entrants must fulfil the above entry conditions before the time the competition closes. Current members/followers are eligible to enter the competition. Only one entry per person. Only one winner per household. To be a valid winner, the entrant must not have won a prize from SWITCH within the last 28 days. 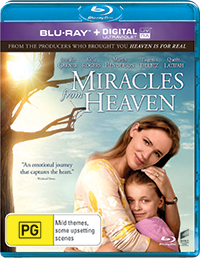 Each winner will receive one Blu-ray copy of 'Miracles From Heaven'. By entering, you agree to receive occasional emails from SWITCH in the future. If you decide to unsubscribe from these updates, any further entries will not be applicable. Only Australian residents are eligible to enter. 'Miracles From Heaven' is available on Blu-ray, Digital and DVD on Thursday the 16th June 2016 from Universal Sony.